Arsene Wenger was furious after Arsenal were denied what seemed a clear penalty in Wednesday's 1-1 Champions League quarter-final draw with Liverpool. Alexander Hleb appeared to be tugged back by Dirk Kuyt and boss Wenger told BBC Sport: "It was a blatant penalty, under the eyes of the referee." 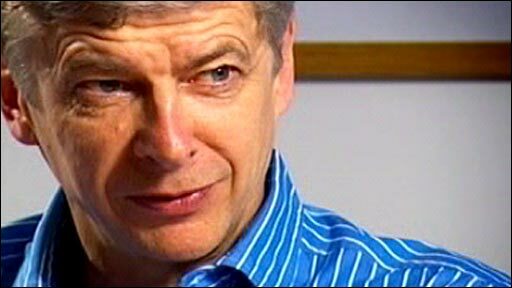 Wenger, though, feels his side will get the result they need to progress in the second leg at Anfield next Tuesday. "It will be a test for us, but we have the desire to do it," he said. "I feel we were not rewarded for what we produced - and we had the chances to win it. "We were a bit unlucky with a big decision of the referee on the penalty. It's difficult to take, but we have to swallow it." Dutch referee Peter Vink appeared to be well-placed to see whether Hleb was impeded by Kuyt in the second-half incident which occurred with the score at 1-1. Wenger was left dumbfounded after Vink waved away Arsenal's appeals, but he insisted his side still should have the advantage in the tie after dominating for large spells. "It is difficult to understand how we did not win the game, because we had a lot of possession and a lot of chances," he said. "Liverpool created very little, and the whole second half was played in one half. "If you look at our amount of possession compared to Liverpool, it is frightening that we could only come out of it with a 1-1. "I cannot fault the players. We were unlucky in the circumstances, notably with the Nicklas Bendtner chance." Substitute Bendtner unwittingly cleared a Cesc Fabregas shot off the line but he had already been ruled offside. "The game was played in one half in the second period and it was difficult because Liverpool defended well," added Wenger. "I think Kuyt played second right-back and on the other wing they defended deep and it was difficult to find space." Before the second leg the sides meet again in the Premier League on Saturday and Wenger feels that encounter could be significant. "It might take more out of us than this game," he said. "It is now a little bit of a survival battle - the one who is still good after three games is the one who is the better team." Wenger revealed forward Robin van Persie is a doubt for Saturday's lunchtime kick-off, having been replaced by Theo Walcott at half-time because of a thigh problem. He said: "We had to take him out as a precaution. It doesn't look too bad, but we think he may be short for the next game."